Raised garden planting beds are simple in design, they are compose of walls, corner poles and caps only. Dovetail grooves cut on two sides of corner poles, just push walls into grooves would be ok. Caps fixed to top of corner poles by thin screws. 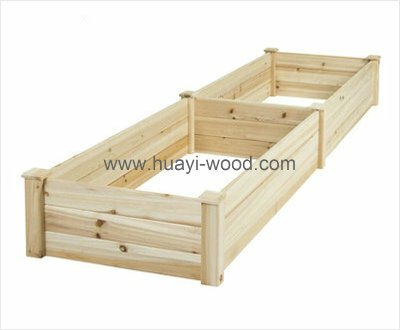 Made of Chinese fir wood with natural finish, this raised garden bed is long lasting outside and anti insects, they are totally safe to vegetables than those stain or paint finish garden planting beds. Square and rectangle styles for selection.